I started my cooking career as a Commis Chef at Bar Diesel in Edinburgh, before long I moved to Monteiths Restaurant in Edinburgh and was taught under the Head Chef, Phil, who ignited my passion for making everything from scratch. I then decided a change of scenery was what I needed and moved to Brisbane where I worked at Rhubarb Rhubarb in the pastry section, I learnt a lot about classic French cooking and desserts during my time there. I then moved to Cha Cha Char where I was a Demi Chef – it was my first experience working in a large restaurant and kitchen, I gained a lot of confidence in my time there. I returned to Scotland and began working for Monteiths again cooking contemporary Scottish Cuisine. The role of Sous Chef was a lot more demanding than any of my other roles but I really enjoyed being involved in menu creation and I spent 7 days a week in the kitchen. The head chef from Monteiths moved to Bon Vivant and I followed him, we had a daily changing menu and created seasonal dishes. The opportunity to be a Chef in France came up at Ski3V where I worked alone in the kitchen catering for 30 guests. I cooked breakfast and a 5 course evening meal 6 days a week. I also had complete freedom and enjoyed surprising guests with creative dishes and working with French ingredients. I then moved back to Brisbane and worked as the Chef de partie at Stokehouse which had a chef hat when I worked there. 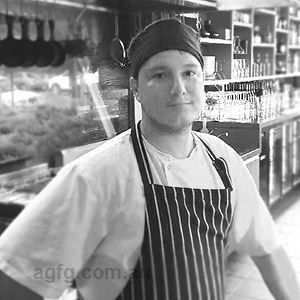 I became the Head Chef at Craft where I had complete control of the kitchen making tapas and mains. I have recently moved to Apple Tango where we have seasonal menu changes and the style of food is global share plates. It is a great chance for me to be very creative where I can take influence from all over the world and create uncomplicated fusion dishes that are full flavour. No. I had worked as a dishwasher for 2 years when I was at school. After I left school I wanted to be involved in sports and went to college for 2 years. I decided it wasn’t for me and left college when I was 20. I applied for a job as a kitchen hand/commis chef. My interest in food and combining flavours grew and I decided I wanted to make being a chef my career. Making as much food from scratch as I can and keeping food as natural as possible. At Apple Tango we make things like our own yoghurt, breads and spice blends like our ras-el hanout. I like to take existing dishes and cook them my way. I also love creating new dishes. I am influenced a lot from where I have travelled and lived, especially in Asia. I like trying something new and thinking about how I could make it work in my kitchen. He is Scottish/ Filipino and cooked with the principle of making everything from scratch. He taught me a lot early in my career, with a style of cooking that takes no short cuts and cooks everything fresh. This moulded me into the chef I am today. Probably my favourite “celeb” chef. He is a multi-cultural chef specialising in South East Asian cuisine. After reading his book I went to his restaurant in Hanoi, Vietnam which was great. He shows that “fusion” food can be done well, without being over complicated. I take inspiration from his food style and cooking without barriers. We have a seasonal taste menu that changes every month. In February 2015 it’s Chinese New Year. One of the dishes from that menu is double cooked pork belly, which is our interpretation of pork with black bean sauce. The pork belly is given a dry rub of aromats and our home made 5 spice. It is slow cooked for 8 hours and then carved and cooked again till crisp. I serve it with our home made kimchi, black bean puree, fresh apple and turmeric infused oil. Blackened sticky beef cheeks. This is our most popular dish on the menu and is great value for money. The beef cheeks are marinated over night with a mix of squid ink, hoisin sauce, soy, chilli, ginger, lemongrass, garlic and coriander. After marinating, a demi glaze is added and the cheeks are cooked for 6 hours. The sauce is then reduced to a sticky glaze and the dish is finished with picked fennel and fresh radish.